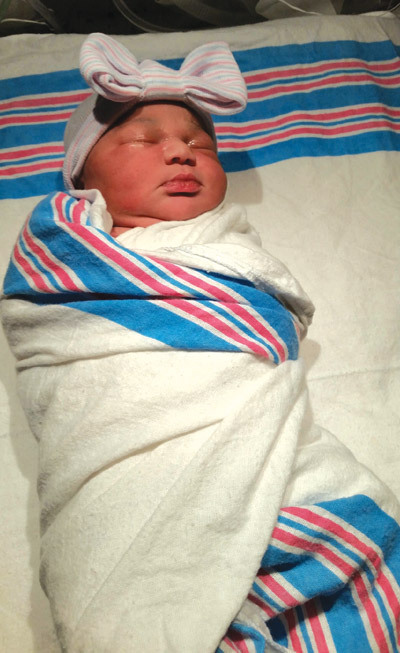 Emma Delva arrived at noon on Thursday, Feb. 5, 77 hours after the hospital first opened its doors. No matter what else she achieves in life — doctor, teacher, president of the United States — Emma Delva will always be No. 1. Emma was the first baby born at the new St. Joseph’s Hospital South, arriving just three days after the $237-million facility opened on Simmons Loop in Riverview. The excitement about the first arrival at St. Joseph’s seemed to infect everyone at the hospital from nurses and doctors to the security guards, Nikita said. “Everyone was excited and super nice, kind and genuine, so that was one of the things that we truly enjoyed about it,” Nikita said. 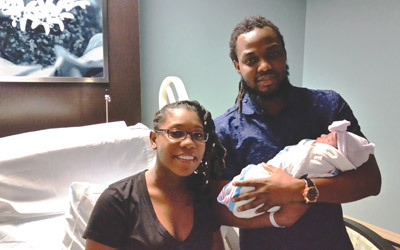 Proud mom and dad hold baby Emma, the first baby born at the new St. Joseph’s South Hospital in Riverview. As the first baby born at St. Joseph’s, baby Emma and her mom received a pink gift basket. The first boy born at the hospital will receive a blue gift basket. The first 100 babies born at the hospital will receive a tote bag. St. Joseph’s Mother/Baby Unit includes 14 beds with private rooms to accommodate mother, baby and family. A 10-bassinet nursery will also be available. Equipped with 112 beds, the 360,000-square-foot hospital offers 20 separate medical services including emergency, orthopedics, labor and delivery, a cardiac catherization lab and surgical suites. St. Joseph’s, part of the BayCare Health System, is the sister hospital to St. Joseph’s Hospital North in Lutz. Many of the lessons in patient care and comfort learned there were implemented at the new hospital. For more information on volunteering or employment opportunities, visit BayCare on the Web at www.baycare.org/SJH-South. An orientation tour for learning more about the hospital is also planned for March. Visit the hospital website for more information.